Do you need a visa to travel to Costa Rica? PLEASE NOTE: MY COSTA RICA IS A TRAVEL AGENCY. WE’VE WRITTEN THIS PAGE AS A GUIDE. WE CANNOT HELP YOU APPLY FOR OR GRANT YOU A VISA OF ANY KIND. IT IS ALWAYS ADVISABLE TO CHECK WITH THE CONSULATE OF ANY COUNTRY YOU INTEND TO TRAVEL TO BEFORE YOU MAKE YOUR PLANS TO ENSURE YOU HAVE THE MOST CURRENT INFORMATION ABOUT VISA AND VACCINATION REQUIREMENTS OR HEALTH AND SAFETY CONCERNS. FOR INFORMATION ABOUT APPLYING FOR A COSTA RICAN VISA VISIT THE COSTA RICA CONSULATE WEBSITE. According to the immigration department of Costa Rica, there are 4 different groups of international countries that have four different visa requirements for their citizens to enter, visit and stay in Costa Rica. Citizens of the first and second group of countries do not require a Costa Rica visa. They will receive a visa on arrival and obtain an entry stamp in their passport. After receiving the entry visa, make sure to always double check the entry and exit stamps! Sometimes the authorities can make a mistake which can cause you some problems later on. Citizens of the third and fourth groups of countries will be required to register for a restricted Costa Rica Visa which must be applied at least 90 days before expected travel. They must have a valid passport with at least one day left and arrive in Costa Rica with a return ticket proving they will leave the country within the tourist visa period, usually granted for 90 days upon arrival in Costa Rica. The length of the tourist visa granted is at the discretion of the immigration official at the point of entry to Costa Rica, but is usually granted for a stay of 90 days. ANDORRA, ARGENTINA, AUSTRALIA, AUSTRIA, BAHAMAS, BARBADOS, BELGIUM, BRAZIL, BULGARIA, CANADA, CROATIA, CZECH REPUBLIC, CHILE, CYPRUS, DENMARK, ESTONIA, FINLAND, FRANCE, GERMANY, HOLLAND, HUNGARY, IRELAND, ICELAND, ISRAEL, ITALY, JAPAN, LATVIA, LIECHTENSTEIN, LITHUANIA, LUXEMBOURG, MALTA, MEXICO, MONACO, MONTENEGRO, NORTHERN IRELAND, NORWAY, NEW ZEALAND, PANAMA, PARAGUAY, POLAND, PORTUGAL, PUERTO RICO, REPUBLIC OF SOUTH KOREA, SAN MARINO, SERBIA, SOUTH AFRICA, SLOVAKIA, SLOVENIA, SPAIN, UNITED KINGDOM OF GREAT BRITAIN, UNITED STATES. They must have a valid passport with at least three months left and arrive in Costa Rica with a return ticket proving they will leave the country within the provided length of time in the visa. The length of the tourist visa granted is at the discretion of the immigration official at the point of entry to Costa Rica, but is usually granted for a stay of 90 days. ANTIGUA , BARBADOS, BELIZE, BOLIVIA, DOMINICAN REPUBLIC, EL SALVADOR, FIJI, GRANADA, GUATEMALA, GUYANA, HONDURAS, MARIANA ISLANDS, MARSHALL ISLANDS, SOLOMON ISLANDS, KIRIBATI, MALDIVES, MAURICIO, MICRONESIA (FEDERATED STATES), NAURU, PALAU, PHILIPPINES, KINGDOM OF TONGA, RUSSIA, SAMOA, SAINT KITTS AND NEVIS, ST. VINCENT AND THE GRENADINES, ST. LUCIA, SAO TOME, AND PRINCIPALITY, SEYCHELLES, SURINAM, TUVALU, TURKEY, VANUATU. The request for a restricted Costa Rica Visa must be addressed to the Commission of Restricted Visas. The application must be admitted by the applicant and their relative residing in Costa Rica or indeed their attorney. The relationship to the applicant as well as the qualifications have to be stated. The documentation has to be authenticated by an attorney accredited for said purposes. The length of the tourist visa granted is at the discretion of the immigration official granting the visa entry to Costa Rica, but is usually granted for a stay of 30 days but can be up to 90 days. TUNISIA, TURKMENISTAN, UKRAINE, UGANDA, UZBEKISTAN, VIET NAM, YEMEN, DJIBOUTI, ZAMBIA, ZIMBABWE. AFGHANISTAN, BANGLADESH, CUBA, ERITREA, ETHIOPIA, HAITI, IRAN, IRAQ, JAMAICA, MYANMAR (BURMA), PALESTINE, SYRIAN ARAB REPUBLIC, DEMOCRATIC PEOPLE’S REPUBLIC NORTH KOREA, SOMALIA, SRI LANKA. DETAILS FOR THE REQUIREMENTS NECESSARY TO APPLY ARE LISTED BELOW. MEETING THE REQUIREMENTS TO APPLY FOR A RESTRICTED DOES NOT MEAN THAT YOU WILL NECESSARILY BE GRANTED A VISA. YOU WILL HAVE TO WAIT A MINIMUM OF SIX MONTHS TO APPLY AGAIN IF YOUR VISA APPLICATION IS DENIED. The cost is $52.00 non-refundable. CONSULT THE COSTA RICA CONSULATE IN YOUR JURISDICTION FOR PAYMENT METHOD. Photocopy of every page of the applicant’s Passport notarized, signed by the Consul, and translated into Spanish. The passport must also have at least six months of validity. A visa request letter addressed to the Consul of Costa Rica. Your itinerary or a temporary reservation of your ticket. 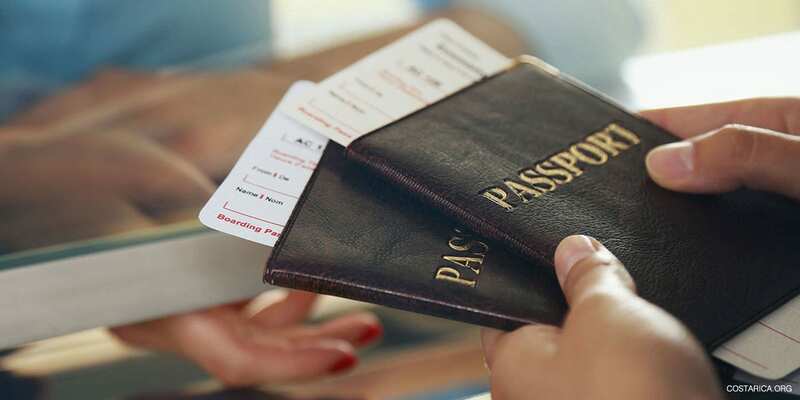 It is recommended that airline tickets not be purchased until your visa has been approved as there is no guarantee your visa application will be. On arrival in Costa Rica proof of Reservation or ticket proving they will leave Costa Rica within the tourist visa period, usually 30 days. The exact address of the place where the applicant intends to stay in Costa Rica with a phone number. Photocopy of the identification document of the person who is applying for the applicant, which must be confirmed by an immigration officer or attorney or other immigration officials. Proof of economic solvency (bank account statements, salary statements, income tax forms) for the last three months. Police record issued within the last six months authenticated by the Secretary of State and Translated into Spanish. Date and location of arrival and departure in Costa Rica. Date and place of birth and copy of birth certificate. One color photograph (2×2 inches). Proof of legal status in the United States. Visas will be issued to individuals with a legal status in the United States. Individuals who do not meet these requirements should apply for a visa in their country of origin. The cost is $ 52.00 non-refundable. CONSULT THE COSTA RICA CONSULATE IN YOUR JURISDICTION FOR PAYMENT METHOD. Signed and authenticated letter issued by the Costa Rican entity that requests the entry of the foreign person. A request addressed to the Commission of Restricted Visas, subscribed by the person concerned, his relative residing in Costa Rica or his attorney, stating their qualities and the relationship to the sought person, including the following information of the foreign person who seeks the visa. Indicate the consulate to which the Visa should be sent if the applicant is abroad. If the applicant resides in a country where there is not a Costa Rica consulate, it should be indicated in the request, and listing the closest Costa Rica consulate in the country where the person is at, or if it should be sent to the applicant’s representative. In the latter case, the representative will be responsible for delivering the notification to the applicant so that he has a copy before he enters Costa Rica. The request has to be signed by the person who seeks the visa before a competent notary public. Certification, the applicant, does not have a criminal record in his country of origin. Or in the country, he has resided for the last three years. A notarized copy of the Immigration Act signed by the Consul translated into Spanish. Not everyone needs to apply for travel visas and many people who choose to stay for a longer period of time, opt to apply for a working visa or a residence permit. Residents will be allowed to travel in and out of Costa Rica much like nationals can. You cannot use the benefits of these until the residency is valid, not just in progress. Contact your embassy or consulate for the specific rules your country has for becoming a Costa Rica Resident, but know that the majority of the process will require you to obtain official documents from your country of residence that need to be translated to Spanish. Read more about relocating or moving to Costa Rica. Costa Rica is a country worth traveling to! Come visit Costa Rica and enjoy your trip!